Step out of your box, your comfort zone and go beyond what’s easy. I teach and advocate this but at times find it difficult to do myself. We all prefer familiar and what doesn’t require much effort, but that WILL NOT strengthen our mind and memories. The comfy way doesn’t create the cognitive reserve which will help us to utilize our brains to their best capacity when older. It’s time to use not just the familiar, but stretch and grow into the unfamiliar. It’s time to use our whole brain! Summertime is a time to reflect, relax and rejuvenate. Up until a bout a week ago, for me it was anything but these. It felt like a sprint and I was just trying to keep it all going and manage well. I fell into patterns and routines that were tried and true and would help me function well. There’s nothing wrong with this approach and it was beneficial for that time. However, now that patterns are changing and I have a few moments to breathe, it’s time for something new. How we learn and take in information best varies for each of us. I like visual and auditory, prefer routines and organization. But there are also times to use my hands, be spontaneous and go with the flow. Summer is a great time to experiment and step out of our natural, preferable routines and try something new. When we do this, we activate parts of our brain that may be underutilized in our normal patterns of behavior. We use our whole brain not just the dominant part, which will be extremely important as we age. Here’s a quick example-grab a pen, go ahead, right now-grab a pen. Which hand did you grab it with? I bet it was with your dominant hand-the one you write with and do most things. Now grab that pen with the other hand-feels different doesn’t it? Now write your name with your non-dominant hand. Not so easy? Our left and right brains work differently, yet together. Patterns of behavior and our natural tendencies dictate which side becomes a bit more dominant. But that doesn’t mean it’s the only side we should use! The more we use the non-dominant side of our bodies, it causes us to think differently. To write with our non-dominant hand we have to really think about how to make every letter. It’s like learning to write all over again. But we can do it, it just takes a different set of impulses to relay the information to that side of our body. Simply by using that other hand, we activate all kinds of brain cells in different ways. It’s similar to using different muscles-when we first use them, they can be sore and feel clumsy. But the more we use them, the easier the motion and the more we strengthen them. Now we can take this same concept and apply it to how we manage our days, what we choose to do, and how we act and think. It can be as simple as picking up a pen with the other hand to changing our entire approach or outlook. Whatever we do to use the lesser utilized parts of our brain inevitably strengthens those areas. This allows us to use these areas more as we age. The use it or lose it adage totally applies here. Use these areas of your brain now to not lose them later! So are you with me? Let’s use our whole brain starting this #SummerToRemember and step out, be a bit uncomfortable and start an adventure of using ALL of our brain. It will surely help us all make our summer moments memorable! Long summer days and nights bring fun, warmth, and many memories in the making. Capturing these memories can be as elusive as containing a firefly on a breezy, summer evening. As we continue our #SummerToRemember series, let’s dig into which techniques are best to record all our moments. We all have our go-to memory techniques that typically work. But what about when they don’t? A new friend tried to recall another person’s name she thought we may both know. It really bothered her when she couldn’t remember the woman’s first name. We laughed at how we knew she’d eventually think of it and she did–about an hour later, as is often the case. We don’t always know how our unique memory works, just that it does (or sometimes doesn’t)! Typically, we try to associate or write things down. Others capture moments in pictures for posterity and prompt recollections later. These are some of my favorites as well as verbal repetition. I too never used to think much about HOW I remembered, but now I do. Studying memory in depth and applying specific techniques in my own life has shown I benefit from my go-to favorites but also using many techniques in tandem. I’m a visual and auditory person. I prefer these avenues of taking in information as opposed to being more hands-on and tactile. To that end, visual and auditory memory techniques like visualization and written and verbal repetition are my go-to techniques. I also benefit from a heavy dose of visual association. When traveling, I like to see the map. I recognize visual landmarks and can typically remember where I was and who I was talking to when visually recalling a venue. All of this plays into my strengths and aids in making memories. My daughter has a great memory for the golf courses she plays. Since I’m often watching her play, we’ll discuss various holes and I recall them best by visualizing the landmarks of each. First, I need to pay attention, but as we go over it, she’ll mention a visual cue and then I know what hole she’s referencing. I don’t remember like she does, but the visual cues help. If that doesn’t work, I refer to the notes I take as she plays. The different techniques blend together and ultimately, assist my memory. 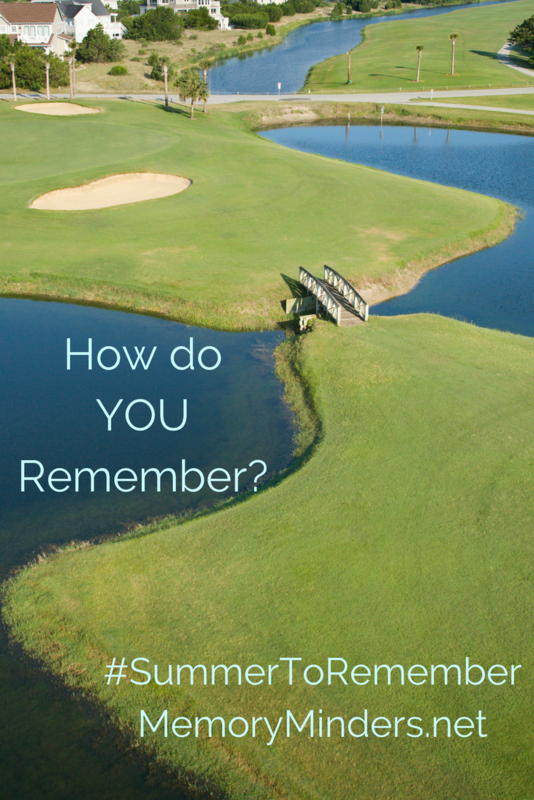 How do you best remember? Is it by visual cues or associations? Do you like to hear things, take notes or pictures? This week, let’s dig into HOW we remember. Your challenge for this week is to think about how you best like to receive information because then this will be the best way to also recall information. Are you more visual, auditory or tactile? Do you like to see, hear or do things to remember? Once we identify this about ourselves, we can use memory techniques that fit with our strengths and remember more this #SummerToRemember! For more in-depth resources on memory, check out the Academy subscription service or contact me for a memory wellness presentation for your group in the future! 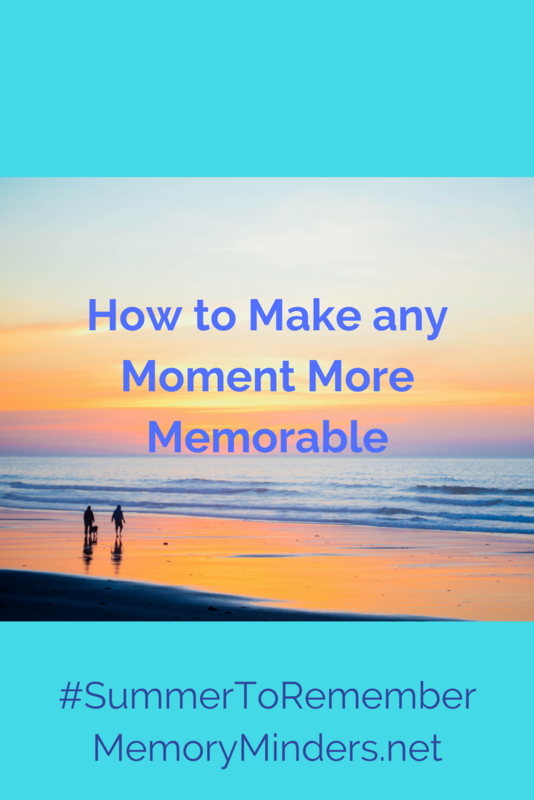 Let’s pay attention to how we remember and capture more of our memorable summer moments! Complex projects, lists and events are often managed best when divided into smaller chunks or portions. The same holds true for memory. To live or remember well, it’s important to think about not only the what but also the how. Our memories are comfortable holding and remembering about three to five things at a time. This is why multiple number items like phone numbers, social security numbers or longer zip codes are split into chunks of three to five. Anything more is cumbersome and won’t be remembered without additional assistance. 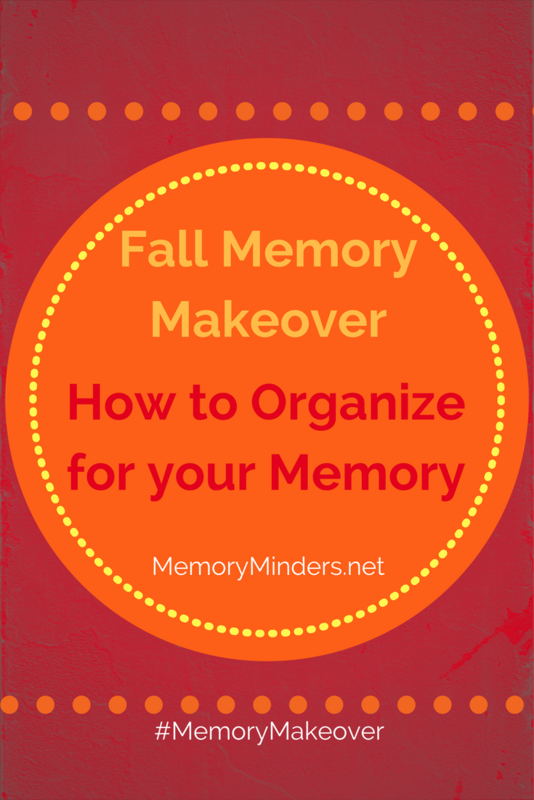 Last week in our ongoing #MemoryMakeover series, we discussed essential organizational tools to help memory. These simple, yet highly effective tools are a lifesaver for remembering day to day activities, appointments, new information, and larger projects. But organization should include not only the what but also the how to be truly effective. To wrap up our monthly theme, let’s end with some general how-to tips to maximize our organization. Identify the most important issue to begin. For most of us, this is what impacts our daily lives-organizing appointments or bills, or cleaning out the frig or closet. Whatever impacts or distracts memory and mind most is where we need to start. Focus on one part of a project or area to organize at a time. Identify the various components and begin with one section to make a direct impact, like the daily schedule. For a larger project, break into manageable sections and focus on just one before moving on. If multiple items absolutely need to be addressed simultaneously, minimize by prioritizing the truly important. Organize sensibly. Whether it’s using a calendar, making a grocery list, or sorting holiday recipes, how it’s organized needs to make sense to you. This is where understanding our learning style comes in. I’m largely a visual learner, so visual cues help me remember and organize well. Contrarily, visual disarray distracts and bothers me. So, I often use color coding or another visual cue to assist in any organizational project. It’s good to purge! It doesn’t matter if it’s transcribing random post-it notes into a calendar, creating a master to-do list or sorting pictures, some things just need to get tossed. Start with one thing, physical area of your home, or designated portion of a project and throw out or recycle what isn’t needed. It makes no sense to organize what is out of date, unwanted or unnecessary. Purge and there’s less to organize! Chip away but finish something small for a win! Often large projects are daunting, but chipping away provides a sense of accomplishment. I’m cleaning backlogged emails by managing as many as possible in a small time frame daily. Managing even just a bit of a big project is rewarding! Do and finish something small then keep going, if time allows. If not, note where to begin again and make an appointment to finish later! Organize when energized. For many of us, this will be in the morning after our brains have rested. Beginning and working on an organizational project needs full brain power, so it’s best to do when our minds are functioning at peak effectiveness. Don’t wait, just start. Doing small things matters. As explained previously, procrastination hurts our memory. When we continue to delay, we’ll eventually forget or learn to dislike whatever we’re putting off. Start small, chip away and see some progress. This will do wonders for our attitude needed to continue. Finish completely. At times, enthusiasm wanes as large or time-consuming organizational projects lose their luster. Persevere to finish completely, even over a period of time. The sense of accomplishment will buoy spirits and encourage continued forward progress with other organizational areas and memory wellness. Keep it organized! Once organized, let’s keep it that way! Every day or routine maintenance applies to keeping up with calendars, to do lists, closets, living spaces, grocery lists, and leisure projects. Staying organized requires less effort and creates helpful memory habits for our lives. This week’s #MemoryMakeover homework is simple-try these how to tips and organize with the tools from last week in at least one area of life to enhance daily life and memory wellness. Let me know how it goes! Organization may not solve every memory issue, but it can help us remember what’s important today. Becoming and staying organized is one the best memory habits we can employ to assist us now and in the future. The question is will we execute on it? Come back next week for that next step in our #MemoryMakeover! I schedule my free time. It’s an oxymoron to schedule or plan free time. It’s supposed to be free as its name implies. But for an organized planner like me, it works. On a big vacation where I planned many things in advance to ensure we’d fit them in, I also knew we needed time with nothing planned. So I scheduled it. My free-spirited friends laughed at me. That’s not how it works, it defeats the purpose of free time, they chastised. But for me, it was an acknowledgment of knowing I needed to be more flexible and that’s how I did it. Are you a planner or do you tend to go with the flow? Does the calendar or clock rule your day or do your feelings dictate your schedule? We tend to find comfort in one of two camps-organized planners or free-spirited improvisers. Regardless of which camp you’re in-both types should let go of natural dispositions and try out the other campground occasionally. Continuing our month of letting go, this week we’re going to get uncomfortable. It’s time to step out of our comfy, natural styles to experience the other side of life. In our MemoryMinders programming, we discuss learning styles and left brained and right brained tendencies. We help our clients learn where their strengths lie because they can use this to help their mind and memory wellness. But these strengths can also become a crutch. We get so used to doing things the comfortable way, using familiar routines, that we can lose sight of attempting the uncomfortable. Life should be enjoyed, yes, but we also need to learn and grow daily. It’s important to use our strengths, but it’s also imperative we stretch ourselves. Striving to improve areas of weakness, trying new or different things and stepping into our discomfort causes our brain cells to stretch and grow. This, in turn, strengthens the cognitive reserve and neuroplasticity we need to withstand age-related or disease-related brain changes which occur as we age. [tweetthis]Step into what’s uncomfortable and stretch your mind! 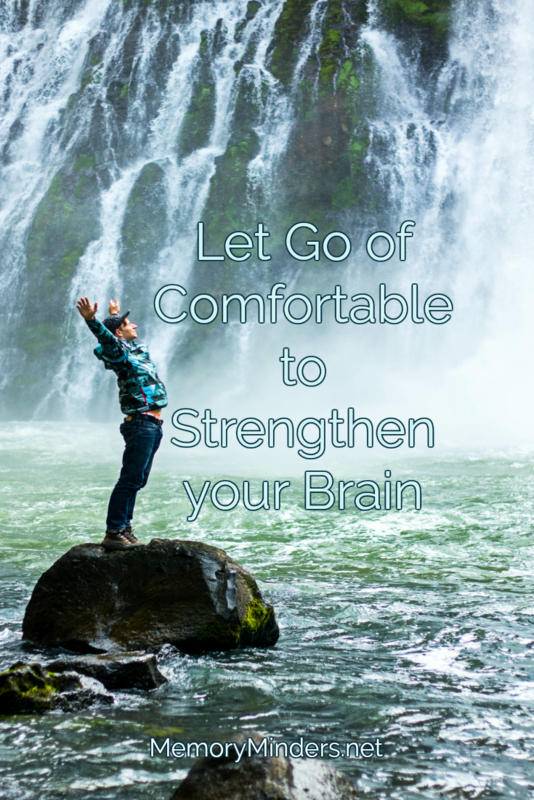 #memory #wellness [/tweetthis]So how do we do let go of comfortable? For the organized planner, it means being more flexible (or even scheduling in some free time!) For the free-spirited improviser, it entails planning or sticking to a schedule. I love being organized. But sometimes, going with the flow and abandoning the schedule for spontaneity stretches me. For my free-spirited friends, planning and sticking to an itinerary pushes their buttons but also grows their brains. How can you let go of comfortable this week? Send me a comment or chime into the conversation on Facebook or Twitter, I’d love to hear from you! Stretch your brain and enjoy stepping into the uncomfortable by trying something new or strengthening a weakness. Not only will you learn something new, but you’ll see how the other camp lives and strengthen your brain simultaneously!